Cradle Mountain (1545 metres) is one of the most popular tourist destinations in Tasmania, especially amongst those looking to get "away from it all". The Cradle Mountain-Lake St. Clair National Park, which encompasses Cradle Mountain, is by far the most popular National Park in Tasmania, but at the same time retains its isolated and wild character. The 161,000 ha. park is a United Nations-recognised World Heritage Area, also enveloping Lake St. Clair, a 200m (600 ft) deep glacial lake, the deepest in the southern hemisphere. 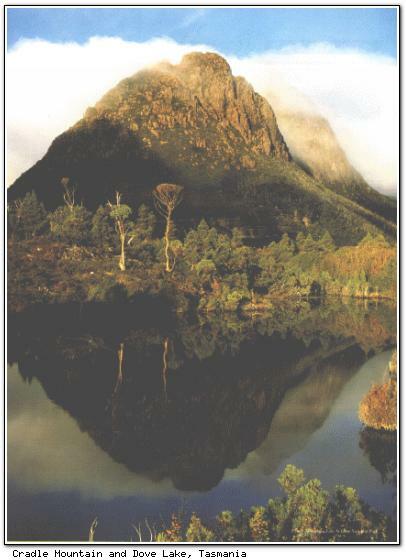 Cradle Mountain boasts a variety of fine bushwalks, varying in difficulty from simple to rigorous. A good beginners walk circles Dove Lake (foreground of below pictures) and takes approximately 1½ hours (prepared paths, mostly flat). For the more experienced, the Overland Track to Lake St. Clair is one of Australia's best-known bushwalks, and covers 85 km (53 mi). Walks go through various terrains, from pandanus and wildflowers to Tasmanian myrtle and King William pine forests. Visitors planning to take any of the lengthier walks are well advised to be prepared for changing weather conditions. Other than campgrounds, the only accommodation in the immediate vicinity of Cradle Mountain is the Cradle Mountain Lodge, on the edge of the park. The Lodge offers 4-star chalet-style accommodation, with a nicely decorated central lounge building. Chalets have wood fires, and bold but friendly native animals will occasionally come to the door looking for food. There is a scheduled feeding time each evening for the not-so-bold. On the whole, Cradle Mountain is one of the ultimate Tasmanian destinations. 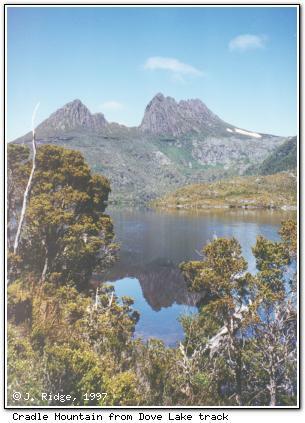 In the vicinity of Cradle Mountain (and still within the national park) is Mt. Ossa, the tallest mountain in Tasmania. 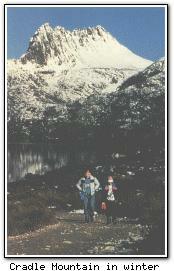 Cradle Mountain is approximately 90 min drive from Devonport.